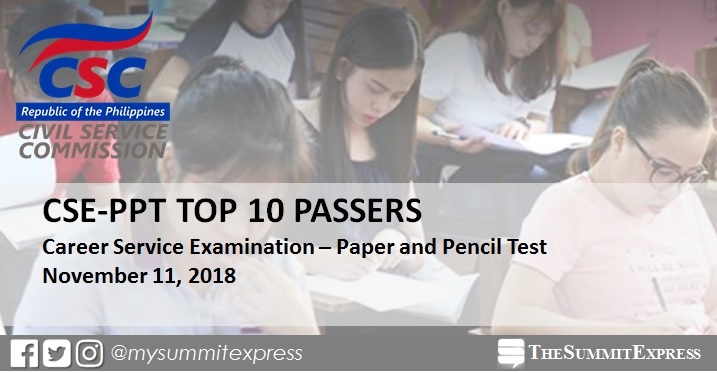 MANILA, Philippines – The Civil Service Commission (CSC) released on Tuesday, January 8, the list of topnotchers or top 10 passers of November 2018 Civil Service Exam or Career Service Examination-Pen and Paper Test (CSE-PPT). View on this page for professional and sub-professional level list of highest placers. The CSE-PPT exam conducted in the National Capital Region (NCR) and Rizal was a reset of the suspended civil service exam last August 12, 2018 due to torrential rains brought by the southwest monsoon (Habagat). On Friday, January 4, CSC officially released the list of passers. A total of 3,935 in NCR and 183 in Region IV (Morong, Rizal) passed the professional level of examination (4,118 out of 37,994 examinees or 10.84%). In the sub-professional level, 818 of the takers in NCR while 47 examinees in Morong, Rizal successfully hurdled the test (865 or 11.53% passed the test out of 7,505 total takers). Top passers of both Professional and Subprofessional levels were from NCR. For the Professional level, these are Rebomafil Bayot – 88.68; Melissa Mariano–87.96; Ayin Joy Ahunin – 87.96; Colin Garcia – 87.70; Loise Adrienne Lagunilla – 87.69; John Cedrick Valencia – 87.64; Mark Vergel Francisco – 87.46; Michaele Angelo Cantos – 87.44; Herbert Tolentino – 87.43; and Jerome Patrick Gonzalvo – 87.41. For the Subprofessional level: Melchizedek Damgo – 90.36; Eurielle Santos – 90.04; Alessandro Antonio Reyes – 89.42; Carl Nathaniel Natividad – 88.99; Joshua Andrei Austria – 88.70; Jan Kenneth Tan – 88.69; Fatima Ericka Gaerlan – 88.44; Robbin Sarreal – 88.03; Ma Angelica Conwi – 88.02; and Laarni Viray – 87.96. In the August 2018 CSE-PPT, Salveregina Samuelle Sarnillo of Central Visayas aced the professional level exam with 92.35. It was followed by Feristelle Rosef Tambalo of Southern Tagalog with 91.96. Meanwhile, Sophia Isabelle Olalia, also from Southern Tagalog, topped the sub-professional level test with 90.78. In the August 2017 CSE-PPT, Adrian Callangan of Cagayan Valley topped the eligibility exam with 90.87%. It was followed by Bicol Region's Merynel Gratuito with 90.27%. Mark Dave Balmilero, also from Cagayan Valley, topped the exam with 87.54%. The complete list of successful examinees of the November 11, 2018 Career Service Examination-Pen and Paper Test is already available on this page or on the official website of CSC. Successful examinees are advised to coordinate with the CSC Regional Office for the availability of and the requirements and procedure in claiming their Certification of Eligibility (COE). Meanwhile, examinees, both passed and failed, may generate their individual rating through OCSERGS or Online Civil Service Examination Result Generation System, which can also be accessed via the CSC website, by Jan. 25, 2019.